Could there be anything more magical than a romantic embrace in the middle of the snow? 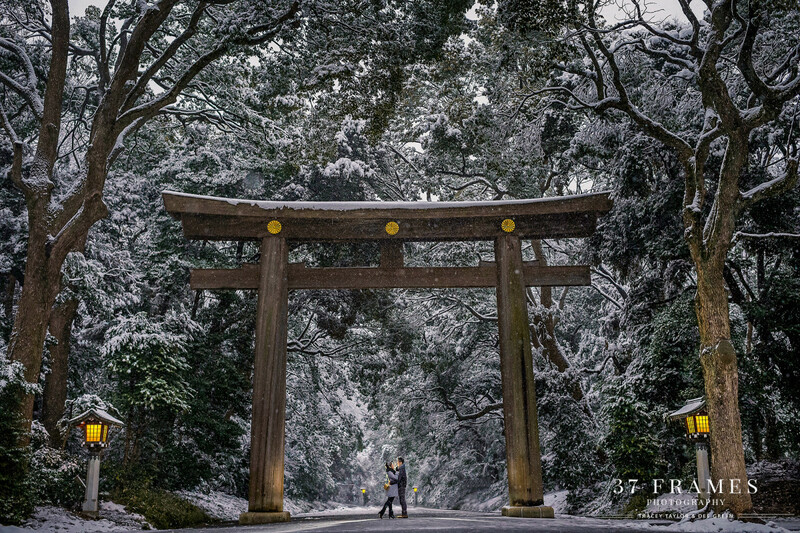 In the winter months snow flakes fall from the sky, transforming the Japanese landscape into a crisp white wonderland. We have a special package on offer for couples in search of a whimsical winter photo shoot. Japan offers many popular destinations for snow seekers. While most of Japan's major cities, including Tokyo, Kyoto and Osaka, receive only small amounts of snow, locations offering snow experiences are readily accessible. The snow season in Japan is long, beginning as early as November in some areas, and lasting into May with the peak being in February. Dramatic snow photos are no walk in the park, however, the memory of struggling through the snow together for each shot will be something you treasure for a lifetime! See below for a special snow package we have on offer for a limited time only. We currently have a very special package on offer which includes both hair and make-up. 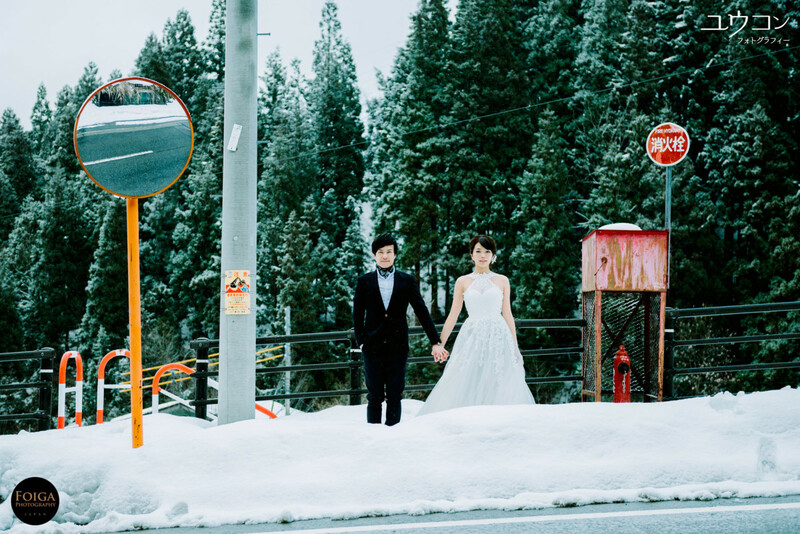 Listed below are some of our most highly recommended Japan-based photographers for taking your dreamy photo shoot in the snow. Please have a look through their profiles to find a style that best suits the kind of photography you would like for your photo session. We work with over 300 photographers across Japan so please do not hesitate to contact us if you would like to request a photographer who is not listed below. Many of our photographers speak English or an interpreter can be arranged. When you have decided on the photographers you like, please send a booking request via the form at the bottom of this page. Upon receiving your request, we will contact you with a tailor-made photo package that best suits your budget and requirements. * High resolution digital images (appropriate for printing) of all edited photos. Please consult with your photographer for exact details. First, select the package and photographer you would like and fill out the request form below with your details, desired date, and any ideas or requests you have for the photo shoot. Before you send your request, we strongly recommend discussing the photo shoot date and any other important details with your partner and/or other people participating in the shoot. After we receive your request we will contact you with the photographers who are available and a tailor-made quote for a package that best fit your requirements. When you have come to a decision we will guide you through the payment process. Your booking is confirmed once payment has been made. Once your booking is confirmed you can begin discussing the details of the photo shoot directly with your photographer. The Famarry Support Team is also available to help you with any questions you may have. The photography style you prefer, and any particular shots you would like to take. Please feel free to contact us if there is anything you are unsure about. If you are having an outdoor shoot and there is bad weather on the horizon, please get in touch with your photographer or the Famarry Support Team and we will organise for it to be rescheduled. Please contact us no later than 3 days before your scheduled photo session. You may need to pay an entrance fee or get permission to take photos in some places. Please make sure to confirm this beforehand with your photographer. If you are unsure then please let us know and we will assist you. Meet with your photographer directly at the meeting point and enjoy taking your photos! The edited photos are usually ready for download between 2 weeks to 1 month after the shoot. Please let us know if you have any special requests. Please write the names of the people participating in the photo shoot. What clothes will you be wearing for the photo shoot? What ideas or requests do you have for the photo shoot? Please be as detailed as possible.